CINCINNATI — Josh Harrison came off the disabled list just in time to give his hometown a show. Harrison tripled home the go-ahead run in the 12th inning — his fourth hit of the game — and the Pittsburgh Pirates rallied after wasting a late lead for a 5-4 victory over the Cincinnati Reds on Wednesday night. After the Pirates blew a three-run lead in the eighth, their player who grew up in Cincinnati helped them end a four-game losing streak. Playing in only his third game since he returned from a broken left hand, Harrison had three singles and the 12th-inning triple off Dylan Floro (1-1) that scored Jordy Mercer, who avoided Tucker Barnhart's tag and slid his left hand across the tip of the plate. "That was the perfect storm for him — playing at home, a lot of people in the stands, coming off the disabled list," manager Clint Hurdle said. Earlier in his career, Harrison tried — and often failed — to provide a big moment when Pittsburgh visited his hometown. This one came naturally. "Just coincidence — right man, right spot," Harrison said. "It happened to be at home." 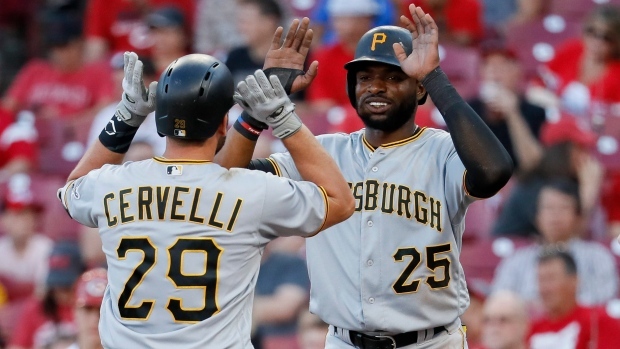 Francisco Cervelli hit a two-run homer on Homer Bailey's 10th pitch of the game, and starter Chad Kuhl drove in another run with a bunt single as the Pirates pulled ahead 4-0. The Pirates wasted chances to break the game open by leaving the bases loaded twice. "I got strikeouts when I wanted to, for the most part," said Bailey, who gave up 10 hits and four runs while pitching into the sixth. "Tonight, a hanging slider in the first inning beat us." Kuhl allowed only one run while pitching into the seventh — Scooter Gennett homered for the second straight game. The Reds tied it in the eighth as closer Felipe Vazquez blew his second straight save chance, but Harrison rescued the Pirates in the 12th. "To put on a special performance and be the hero in your hometown is really cool," Kuhl said. In his three games back from the broken hand, Harrison has gone 8 for 15 with his first four-hit game since 2016. The Pirates left the bases loaded in the fourth, when Kuhl grounded out for the final out, and again in the sixth. They've left the bases loaded four times in the first two games of the series. Overall this season, the Pirates are batting .153 with the bases loaded. Bailey has only one win in 11 starts this season. Over the last four seasons, Bailey has been limited to 37 starts because of elbow surgeries. He's gone 9-19 with a 6.33 ERA. In his last 14 games, Gennett has seven homers and 20 RBIs. Reds: RHP Anthony DeSclafani is scheduled to make his third rehab start on Friday for Triple-A Louisville. He's been sidelined since spring training by a strained oblique.